“Seven Brides for Seven Brothers” (1954), directed by Stanley Donen, is based on the short story “The Sobbin’ Women” by Stephen Vincent Benét and stars Howard Keel and Jane Powell. 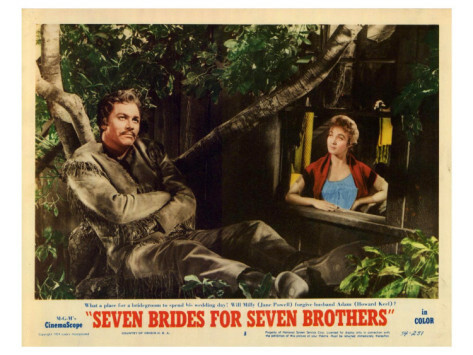 Set in Oregon in 1850, backwoodsman Adam Pontipee (Howard Keel), while in town to buy new supplies, decides to get himself a wife. He meets Millie (Jane Powell), who works in a bar, and likes her right away because she looks tough and knows how to cook. He proposes to her and she accepts, having fallen for him on the spot. They return to his cabin in the mountains as a married couple and there Millie is surprised to learn that Adam lives with his six younger brothers. His brothers are all extremely ill-mannered and soon Millie teaches them how to behave and how to court a girl. 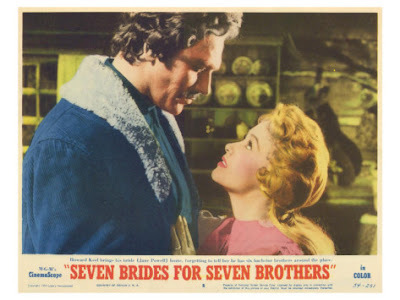 At a barn-raising the six brothers each fall in love with a girl and the girls fall for them too but instead of courting the girls, one night the brothers kidnap them from their homes. At first the girls and Millie are outraged by the kidnapping, but in the end the girls are happy to be with the brothers and of course all’s well that ends well. Director Donen delivers a sparkling and entertaining musical, despite the fact that he had to deal with major budget cuts during filming (which clearly shows in the movie’s painted mountain backdrops). 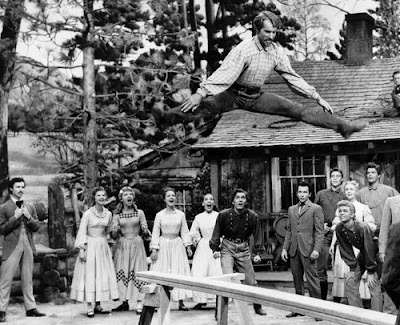 Apparently MGM had little faith in “Seven Brides” and cut Donen’s budget in order to put more money into the musical “Brigadoon”, which was in production at the same time. Ironically “Seven Brides” became the bigger hit. 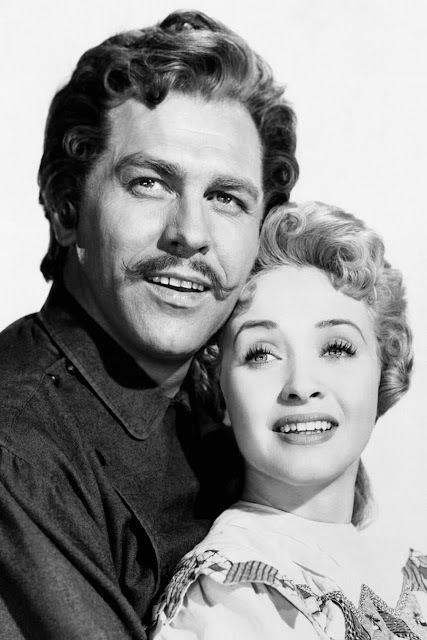 Howard Keel and Jane Powell, the two leads in this film, were both perfectly cast and form a truly nice couple. 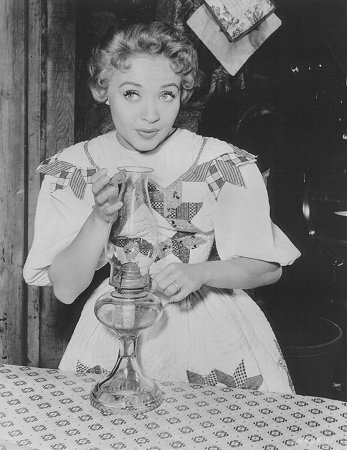 I especially love Jane Powell, who is excellent as the tough and feisty Millie. 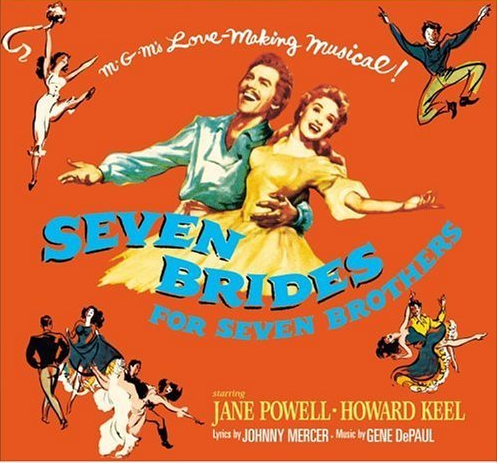 Many of the brothers and their brides were no actors but professional dancers, with the exception of Russ Tamblyn (Gideon) who was a gymnast, and Jeff Richards (Benjamin), who was a professional baseball player. Some of the dancing in this musical is simply superb, the highlight of course being the barn-raising dance sequence. 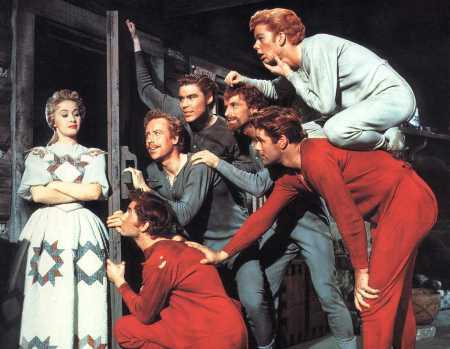 This scene is a true classic and really shows great acrobatic dancing. 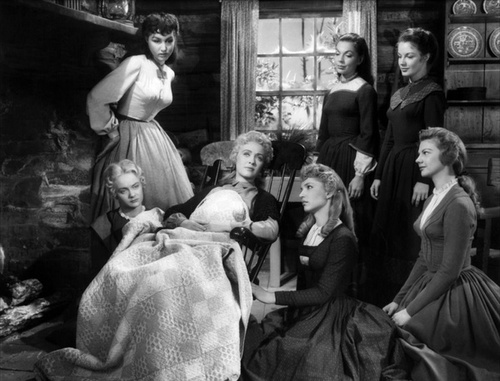 Of course this film also has some great songs such as “Bless your beautiful hide”, “Wonderful, wonderful day”, “When you’re in love”, “Lonesome Polecat”, “Sobbin’ Women” and “Spring, spring, spring”.